Interactive Multi-media, DVD/CD ROM, video production Perth 4 web marketing and Promotion. Video Production and Development Perth Specialists. Tax incentives for producers of video productions. We will arrange the capture of your video production and its conversion to any video format/s you choose. Blue-ray disk production in Perth for your BlueRay player and HD TV. We have TOP professional freelance cinematographers Australia wide. These professionals have made documentaries screened by the Australian Broadcasting Corporation (ABC), British Broadcasting Corporation (BBC) and many others. It will be these highly skilled cinematographers who will be filming your production. We also have a highly skilled professional Australian cameraman who has many years experience with media organisations such as the BBC, ABC, large advertising companies and independent film makers. DVDs will auto start when placed in a DVD Player or PC. 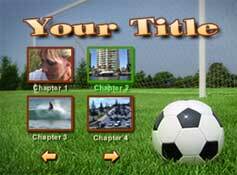 Corporate video presentation embedded in your web page? More of our Perth video production examples embedded in a web page. MUCH higher quality than it would ever be possible across the web. Videos create very large amounts of data and should, where possible, be kept under an hour as this will help in preserving quality. CDs typically fit a maximum of 700mb of data which can be in the form of videos, music, web pages, graphics, documents, etc., but there is a balance between the length of a movie and it's quality when it comes to storage requirements. It is possible to reduce picture quality to hold a longer movie (ie the higher the quality the more storage space required). DVDs can hold up to 4.7Gb of data offering far wider scope. If your images/movies are for the web then digital video camera production isn't suitable for everyone. The reason is that connection speeds to the internet in some countries/locations are relatively slow. Where this is a problem, static images taken and processed by our professional photographers are more appropriate. If a movie is required in these places then a VCD or DVD is the more appropriate medium for movies. We also specialise in corporate digital video production of Perth Hotels and accommodation property marketing, Perth Western Australia. We are prepared to video your Western Australian resort but you would need to fly our Australian freelance digital video production specialist to your hotel resort, in Australia. After editing your accommodation digital video DVD, your digital video production will be mailed to you free of charge. We can also arrange the broadcasting of your hotel video promotion from your own Australian hotel resort website. If you don't have a website we can web design one for you. Location expenses such as Australian cameraman travel are extra. Videography training and digital video editing training in Perth is also available. self-costing alternatives first. If you want to discuss video production options for more than 10 minutes you will need to open an account with us. Techniques demonstrated will revolutionise your message delivery.